Range: Coastal, from New Brunswick to Maryland, and occasionally extending inland. 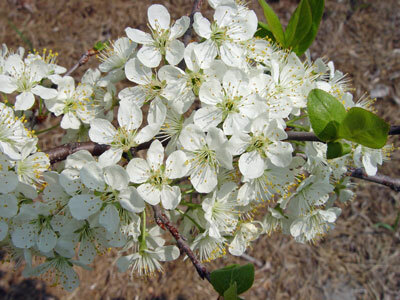 Aids to Identification: Beach plum is normally a low, straggling shrub, but it rarely can be tree-like and grow up to 4 meters in height (not seen this large in Maine). The oblong leaves are finely toothed and hairy beneath. The small, white-petaled flowers are borne in fascicles. The sepals are pubescent on the inside surface, unique for native Maine plums. Fruits are 1.5 cm wide, and they range in color from purplish-black to red or yellow. Ecological characteristics: In Maine, this species is known to occur on sandy coastal beaches from southern Maine northeast to the mid-coast area. Synonyms: Maine populations represented by var. maritima, and this is also known from Connecticut, Massachusetts, New Hampshire, and Rhode Island. No synonyms noted. Variety gravesii is known from Connecticut. Known Distribution in Maine: This rare plant has been documented from a total of 11 town(s) in the following county(ies): Cumberland, Knox, Sagadahoc, York. Reason(s) for rarity: Suitable habitat is scarce. 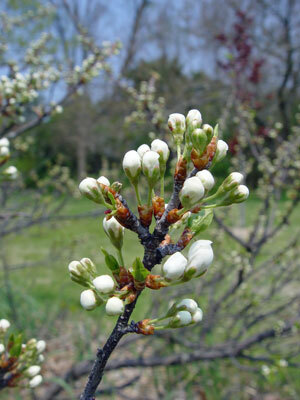 Conservation considerations: Beach plum has not been recently found on many beaches from which there are historical records: beachfront development appears to have reduced the naturally small range of this species in Maine. Known populations are small, and current information is needed to better assess whether the species is also vulnerable to recreational use.